In a blog post almost exactly three years ago, I summarized an April 2013 news article that indicated that a document had been discovered which was now the oldest known extant communication between Vietnam and Japan – dated to 1591, it beat the previously oldest known document, from 1601, by ten years. 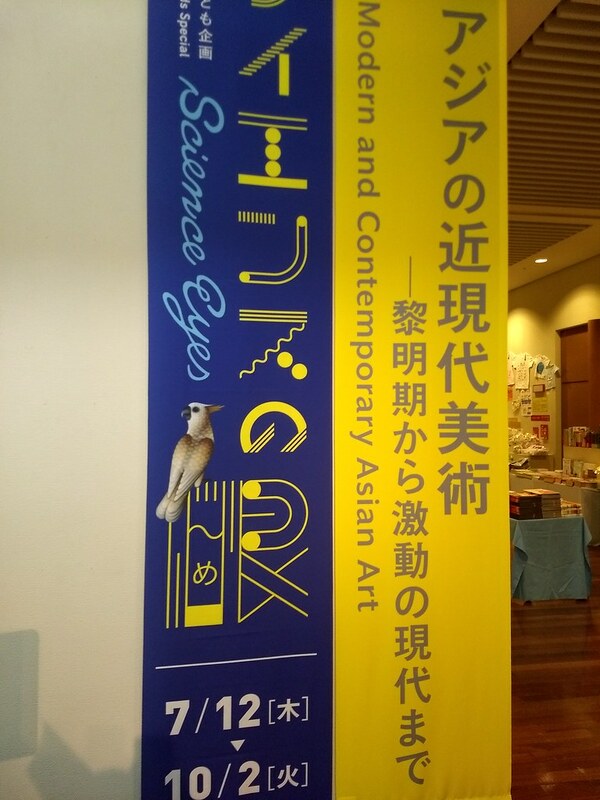 I mentioned in that same blog post that the newfound document would be included in an exhibition being held that summer at the Kyushu National Museum. Well, I’ve now obtained a copy of the catalog to that exhibit (just from the library – not for me to own, sadly), and it is *gorgeous*. 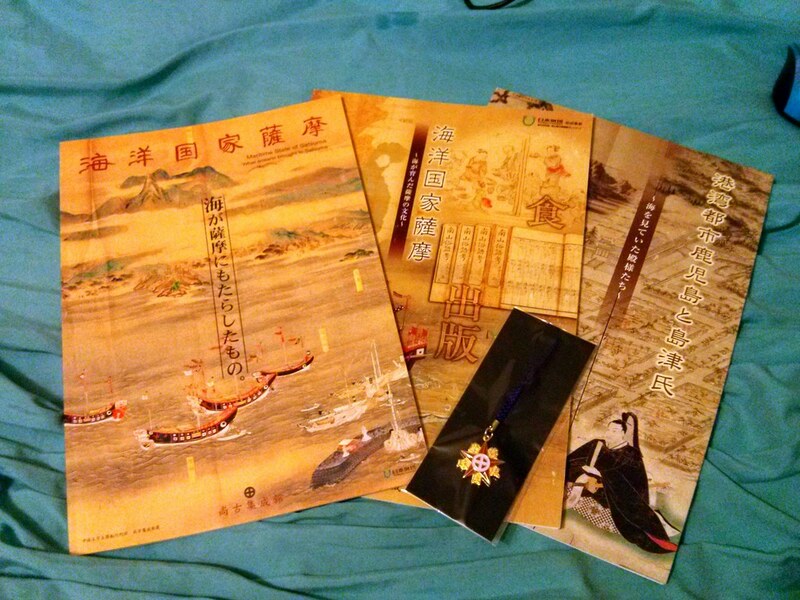 Lots of fantastic stuff – paintings of red seal ships, red seal licenses, objects from the collections of red seal captains, Vietnamese royal crowns, this 1591 letter, other letters exchanged between Vietnam and Japan at that time, not to mention some very nice essays about a range of aspects of Vietnamese history. I was particularly excited to finally learn more about that 1591 document. I know it’s a super obscure one thing, but I think this letter is pretty exciting. And, hopefully, Hideyoshi fans will find it exciting as well. Scanned from the Kyûhaku catalog. 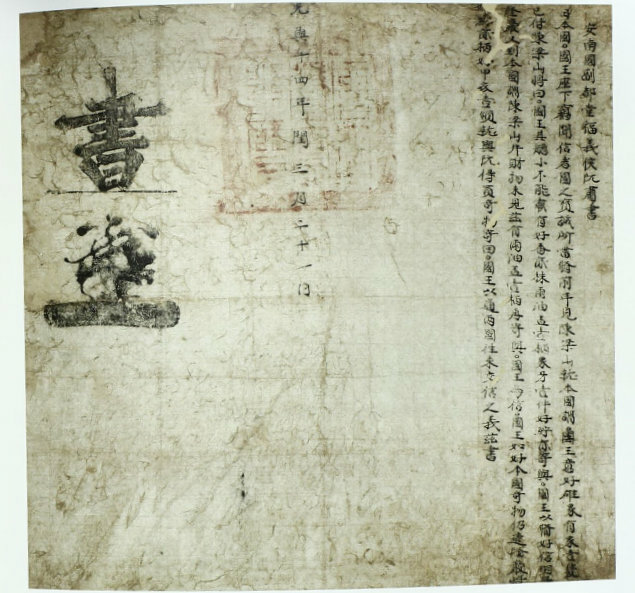 This is the oldest [extant] letter from Vietnam to Japan. It is addressed to “the King of Japan” 日本国国王, from 安南国副都堂福義侯阮, (a lengthy title that I don’t fully know / understand, but) which probably refers to Nguyen Hoang (d. 1613), who would later become lord of Quang Nam / Cochinchina, the southern/central part of Vietnam, and who would also initiate relations with Tokugawa Ieyasu in a 1601 letter previously believed to be the oldest such communication, before this one was discovered in 2013. The content is, roughly, as follows: the previous year, someone named Chen Liangshan 陳梁山 came, and because I [he?] had heard that the King of Japan liked male elephants, I entrusted him with one. The ship was small, and he [we?] couldn’t get the elephant onto the ship, so we sent [instead] favored incense and the like. The following year, someone named Long Yan 隆厳 came to this country, and said that he had not yet seen Chen Liangshan or the goods, and so we gave him those goods over again. Since the King likes strange things from this country, I have sent Long Yan with swords and helmets and armor, that he should buy strange things, and then to establish back-and-forth exchange of communications 往来交信 [i.e. relations] between the two countries, I am sending this letter. At that time (in 1591) in Vietnam, the Mac 莫 clan and the Le 黎 clan were vying for power. The Mac would lose Hanoi the following year (in 1592), and with northern Vietnam embroiled in war, Nguyen Hoang would make his base at Hue, to the south. This letter is addressed from a “Lord Nguyen” 侯阮, so it’s presumably from Nguyen Hoang, or someone closely associated with him. In any case, returning to the 1591 letter, for the addressee “king of Japan,” Toyotomi Hideyoshi would seem the obvious guess. Hideyoshi would establish the red seal ships (shuinsen) system the following year, in 1592. However, there does not seem to be any evidence that either Chen Liangshan or Long Yan ever arrived in Japan bringing Vietnamese goods, and it seems they may have been false envoys who were not of Hideyoshi’s concern/business 関知しなかった偽使 . Still, comparison of the dates – that Japan had an intercalary First Month 閏正月 and that Vietnam had an intercalary Third Month that year – would seem to suggest the genuineness of this document. 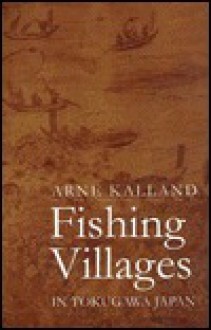 Arne Kalland, Fishing Villages in Tokugawa Japan, University of Hawaii Press, 1995. In his discussion of fishing villages in Chikuzen province, Kalland provides an almost dizzying degree of detail about Tokugawa era fishing techniques and equipment, what kinds of fish were caught, and how they were used or prepared, and also about the complexities of economic logistics, tax structures, and regulations pertaining to fishing in Chikuzen. This book is surely a profoundly valuable resource for anyone studying Tokugawa period fishing villages, fishing, and the like, for the incredible level of detail he provides on a wide variety of aspects of fishing life. And, as such, it really fleshes out our picture of Tokugawa Japan, covering a very significant yet often overlooked sector, beyond the cities, beyond the samurai & townsmen, beyond even the agricultural peasantry. However, for my particular project, since the Ryukyuan missions merely passed through these villages, I think Dusinberre’s brief Edo period chapter may be more directly applicable than Kalland’s entire book; in that brief chapter, Dusinberre mentions more about Korean missions, where they stayed while in Kaminoseki, how many houses they took up, and other key aspects of the logistics and burden of reception of these embassies than Kalland does in his entire book, mentioning next to nothing about inns, the harbor/port reception of any kind of official visitors, or the urban side of fishing villages otherwise. Kalland’s book is immensely valuable for one thing – for those interested in fishing villages – but I wish there existed an equally detailed, extensive, book on commercial port villages, more directly connected into networks of trade and travel. That said, the one chapter on corvée labor (kako) could prove rather useful for my project, as Tokugawa systems of corvée – how people were called up, what types of tasks they contributed to – remain among the lacunae of my knowledge. Here, Kalland reveals that among the chief types of labor villagers in coastal villages were obliged to provide was, simply, the contribution of their boats and their labor for the transportation of officials and their associated cargoes. Though Kalland only speaks specifically of Fukuoka domain, it is easy to imagine, or extrapolate, that similar systems probably prevailed in other domains throughout much of the realm. Suddenly, we get a much clearer idea of how sankin kōtai missions, and Korean and Ryukyuan embassies, as well as any number of other official travels, were conducted: through considerable official appropriation of villagers’ boats and bodies. The numbers Kalland provides are a bit difficult to wrap one’s head around; that the reception of the 1748 Korean mission cost Chikuzen villages somewhere in the range of 120,000 man-hours worth of time/effort certainly makes an impression, suggesting the incredible magnitude of the corvée burden, but it does not give such a graspable, understandable, impression of the impact upon an individual fisherman, or upon a village. Still, combined with the figures and information given by Dusinberre as to how many houses in Kaminoseki and neighboring villages were taken up by Korean missions, we are able to begin to get some sense of the scale of the imposition. 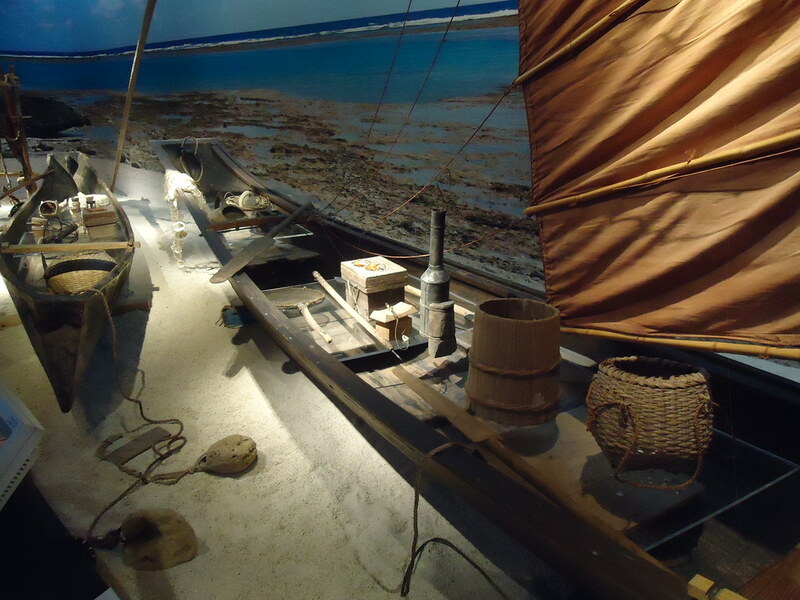 Okinawan fishing boats on display at the Okinawa Prefectural Museum. Probably somewhat different from what they would have used in Chikuzen, but this is the closest thing I happen to have among my own photos. Kalland’s focus on Chikuzen province (or Fukuoka han), however, presents some challenges. As demonstrated by numerous scholars, Mark Ravina in particular, Tokugawa period domains functioned in some important ways like (semi-)independent countries, and varied dramatically in their policies and political, economic, and societal structures and functionings. Thus, it is difficult to know how much of what Kalland shares here can actually be taken to be indicative of economic structures, etc., in any other province. Where the likes of Roberts, Sakai, McClain, and Dusinberre, writing on Tosa, Satsuma, Kanazawa, and Kaminoseki respectively, are to one extent or another clear about how their respective cases are indicative examples or atypical exceptions, Kalland’s engagement with this issue is lacking. He is neither sufficiently explicit about how or why Fukuoka might be an exceptionally distinctive case (as Satsuma would be in a variety of prominent respects), nor explicitly argues that his findings should be taken as applicable to the rest of the archipelago, leaving the question open and vague. As he describes, in many Chikuzen villages, fishermen did not actually own their own equipment, but used equipment owned by an amimoto, an entrepreneur who basically did the investment into the equipment and kept a good share of the return; or fishermen entered into net cooperatives, sharing the costs of the equipment. Did these amimoto and net cooperatives function similarly in other provinces? Did they even exist? Even without going into detail about other provinces, Kalland might have at least discussed whether anything he detailed was or was not typical for the archipelago as a whole. Was the domainal administration of Fukuoka more or less regulatory than in other provinces? Were tax rates particularly high, or particularly low? Were amimoto or net cooperatives particularly powerful or numerous, more so than in other provinces? And if so, why? 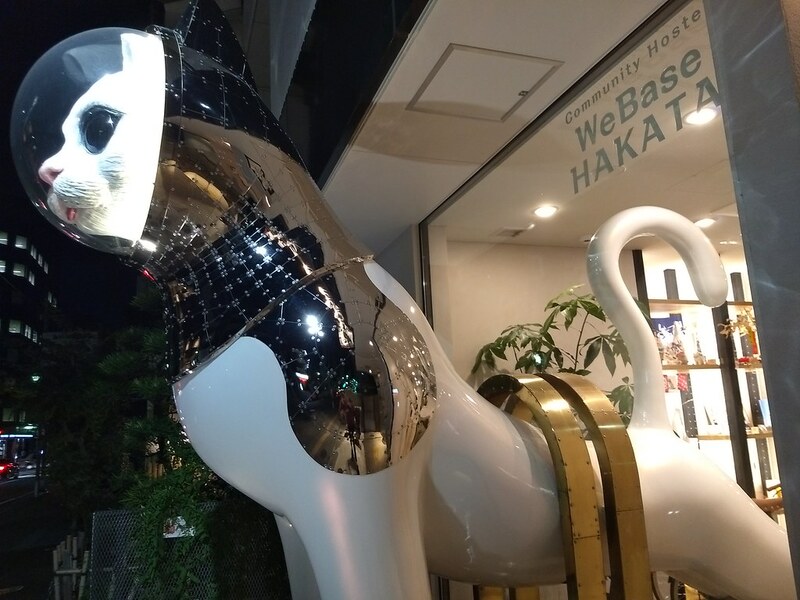 What about Fukuoka’s location, or about the wealth/prestige of the Kuroda, made economic, social, and political structures regarding fishing exceptional, or typical? This sort of approach, as discussed to one extent or another by Sakai, Roberts, Ravina, and Dusinberre, would have dramatically enhanced the accessibility and usefulness of Kalland’s text. Echoing my comments on Dusinberre and Amino, however, Kalland’s emphasis on fishing villages, and his arguments against seeing Tokugawa Japan as merely a dichotomy between urban merchants and rural farmers, are of great value in combating a conception which ignores coastal & maritime activities entirely. 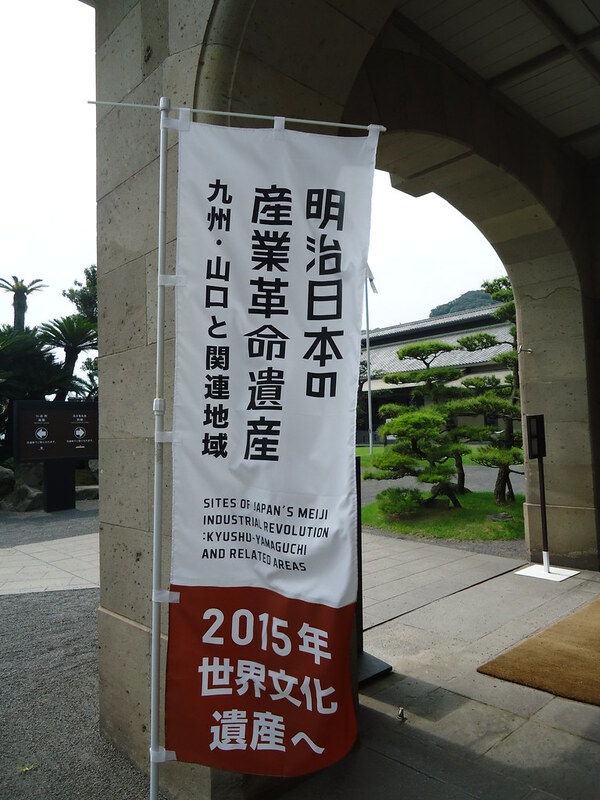 Banner at Shôkoshûseikan in Kagoshima, summer 2014, advertising the campaign to get these sites named World Heritage Sites. Well, after considerable controversy and opposition, Japan’s proposal for a whole series of sites in Kyushu and Yamaguchi prefecture to be named UNESCO World Heritage Sites has been approved. Congratulations to those municipalities, prefectures, and individual sites, and my condolences on the loss of Nadeshiko Japan in the women’s World Cup soccer match thing. I was rooting for you as soon as I found out you made it into the finals, which was about an hour before the game ended. Frankly, I think this is one of Japan’s better World Heritage proposals. I think at one point they were trying to get “Warrior City” Kamakura named to the list – sorry, but while Kamakura may be really significant to Japanese history, I’m not sure there’s any call for it to be called “World Heritage.”1 By contrast, these Meiji period sites are perhaps among the greatest candidates in Japan for “World Heritage” significance – they represent the sites at the core of Japan’s modernization, industrialization, and Westernization at the end of the 19th century. Japan was the very first non-Western country to Westernize (for certain definitions of “Western”), and did so at a supremely impressive pace and degree of success. The controversy, of course, is that Meiji industrialization is directly tied to Meiji imperialism, and to Shôwa militarism and imperialism. Many of the late 19th century sites on the list are exactly the same sites which in the 20th century were major centers of Japan’s war engine, some of them operated in part by forced labor of abducted Koreans. Japan’s wartime history is not something to be celebrated (though, worryingly, I think a lot of people in the Japanese government think otherwise), and least of all Japan’s exploitation of others, e.g. through forced labor. In the end, a compromise was reached, the terms of which were seemingly that Japan got to have its Meiji sites so long as a whole bunch of Korean sites got named World Heritage Sites as well, and so long as the plaques and other information associated with the Japanese historical sites make clear the negative things that happened there. I’m certainly not going to argue that these Korean sites aren’t worthy – Paekche was of great historical significance for Korea and for Japan, and these ancient sites look absolutely stunning in the photos; congrats to them on receiving some extra attention, and extra provisions for their protection. I hope to visit them someday. But, the politics are all too plain. The jostling between countries to have the most World Heritage Sites continues. The Shôkoshûseikan in Kagoshima. One of Japan’s first ever industrial factories, and today a museum of Satsuma history. From what little I know of the controversy, I don’t understand why Japan didn’t simply focus on a smaller number of sites that were more prominently or more exclusively associated with Bakumatsu/Meiji, and not with 20th century developments. The Shimazu villa compound at Iso, for example, was home to the first hydroelectric dam in Japan, the first steamship (built based on Western books, with no Western experts present in person), the first gaslamps, and so forth, and is closely associated with the first modern cotton mill in Japan, the Shûseikan – Japan’s first modern factory, complete with reverberating furnaces, blast furnaces, a smithy, a foundry, and a glass workshop. But, instead, they decided to include, and to continue to insist upon, controversial sites like the coal mines at Gunkanjima (Hashima Island, Nagasaki), which were run in large part, in the early 20th century, by Korean and Chinese forced labor workers taken from Japan’s colonies / conquered territories, all of them working for Mitsubishi, one of the most major corporations at the time producing war materiel. What kind of politics was involved that this site had to remain on the list and be fought for, rather than just being dropped? Was it just stubbornness against backing down to Korean complaints? Was it pressure from local Nagasaki government? Was it the political influence of Mitsubishi? Whatever the case, it seems clear that politics, once again, comes before any semblance of an effort at objective choice of sites based on the expertise of historians & art historians. The Iso ijinkan, or Foreign Engineers’ Residence at Iso, in Kagoshima. I’m certainly more eager to visit some of these sites than others. I’m much more into arts & culture side of things – e.g. 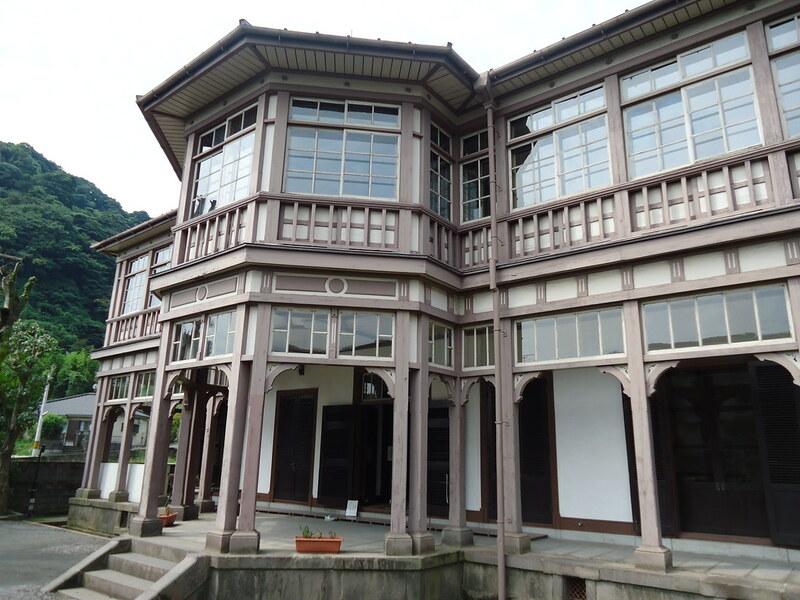 the Hagi castle town, and Glover’s Western-style house – than the ugly, dirty, steel and concrete industrial sites, e.g. coal mines and such. But, that said, I did thoroughly enjoy visiting the few I have already seen – those in Kagoshima – and am glad to see those sites recognized. Looking forward to future trips to Shimonoseki, Hagi, Nagasaki, and South Korea’s many World Heritage Sites as well. 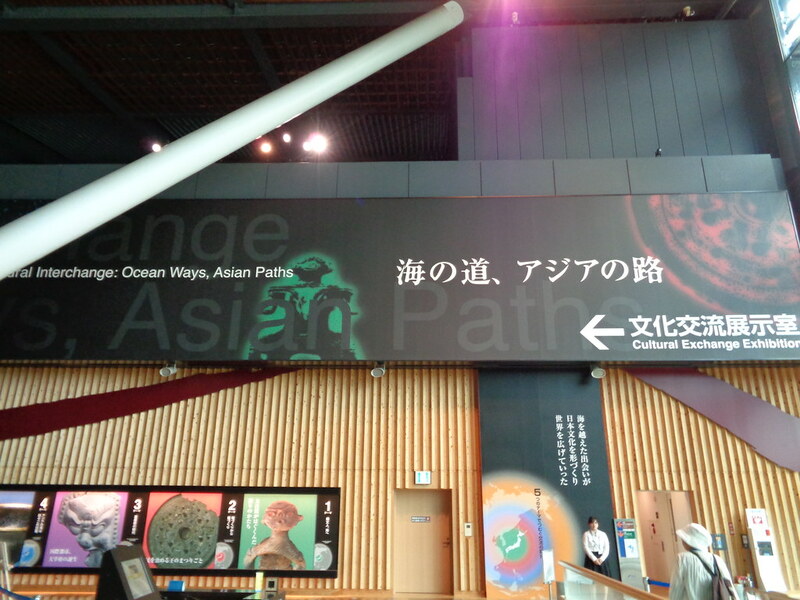 You can read more about the Kyushu-Yamaguchi sites at their official English website. 1) Though, actually, on second thought, the Daibutsu is super majorly iconic, and many of the Zen temples represent a majorly important historical moment in the spread and development of Zen, and in the role of Zen monks as foreign relations advisors and diplomats. 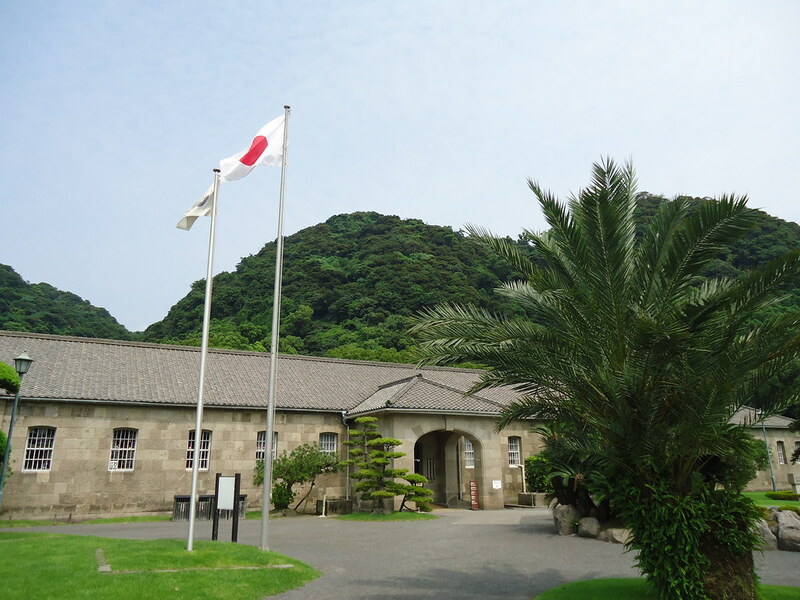 The two main buildings of the Shôkoshûseikan museum, with the Japanese national Hinomaru, and Shimazu clan crest flags waving before them. On my third day in Kagoshima, I finally made it to the Shôkoshûseikan. 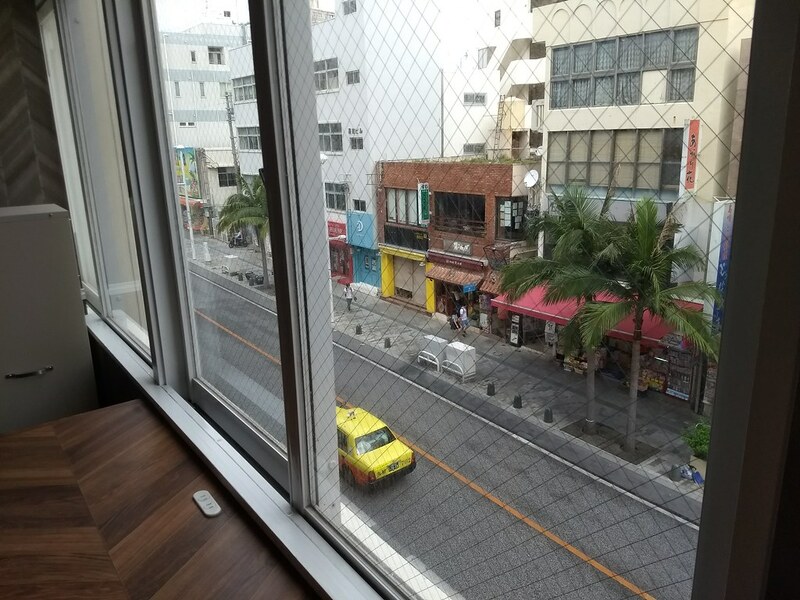 Putting all that nonsense with Kagoshima Station, and with the station staff telling me there was no way to get out there except by taxi, I found out about the CityView bus, and just took that. It’s a tourist bus, to be sure, but it operates much like a regular public bus – wait at the bus stop, get on, pay the right amount (I think it was less than 200 yen) when you get off. Simple as that. No reservations or tour package membership needed. And it lets off right in front of Shôkoshûseikan. The Iso Ijinkan, or Iso Foreigners’ Hall. I had noticed in the last few minutes of the bus ride a few smaller sites – monuments and the like – which I wanted to check out, so I put the whole Shôkoshûseikan compound on hold for a bit, and walked back down. There I found the Isoijinkan (Iso Foreigners’ Hall), a major famous Meiji piece of architecture which also serves as the setting for the only kabuki play of which I’m aware that has anything to do with Ryukyu. Sadly, it’s a postwar play, not an Edo period one, so it’s not really something that falls within my typical purview of study. Or, rather, I should say, of course I could go and analyze it or whatever if I so chose, but it won’t reveal anything about Edo period views or attitudes. 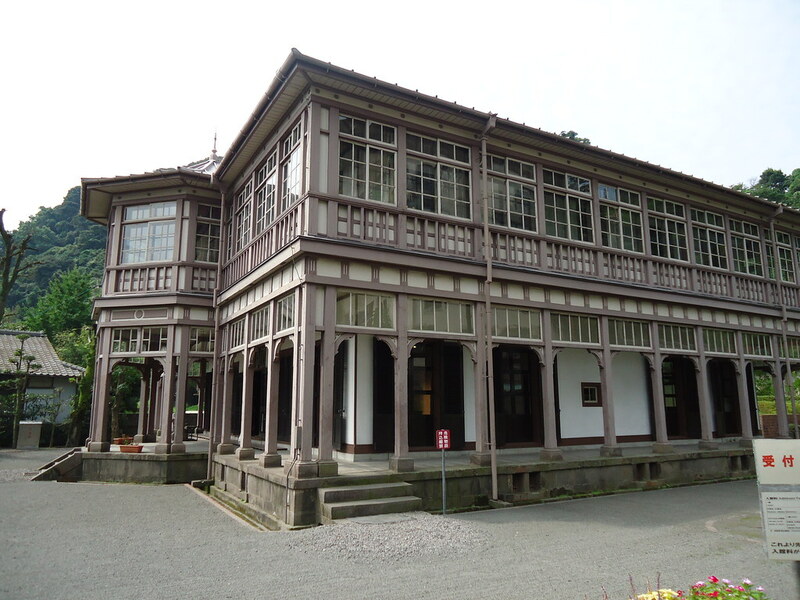 Anyway, it’s a gorgeous and very Meiji-looking building, which was used as housing for British & other foreign engineers. I wish we had more structures like it still in use. Two other Western-style wooden buildings located just down the street, which look like they would be right at home in old 19th century California, house other galleries and such; one is a glass studio. Later in the day, I glimpsed people working with the furnaces, and blowing glass, but I never did end up making it back over there to check it out any more closely. The other of the two buildings was originally built as an office managing the Shimazu clan’s gold mines, but I’m not positive what it’s used for today. Other monuments included one for Satsuma’s first Western-style shipyard, and of its first industrial spinning mill (today the site of a 7-11). I then returned to Sengan’en, the large gardens adjoining the Shôkoshûseikan, and home to the lord of Satsuma’s secondary residence, the so-called Iso Palace. In the Meiji period, after the castle was taken over by the central government, the samurai class abolished, and the daimyo (lord) re-titled, re-situated into the new aristocracy, this became his primary residence. By that time, the palace was already surrounded by – i.e. the gardens were already filled with – industrial foundries, power plants, and the like. Today, the Shôkoshûseikan is just two museum buildings, but originally, back in the Bakumatsu & Meiji period, all of this would have been one large complex, with the lights (and other things?) at the palace being powered by a hydroelectric dam (!!) on-site, as early as 1892. ʻIolani Palace in Honolulu likes to boast having electricity (or is it phones?) before even Buckingham Palace or the White House, and this was only six years later than ʻIolani. One aspect that’s particularly interesting about all of this is that the Shimazu began the process of developing these various technologies – steamships, reverbatory furnaces for forging cannon – before Japan “opened” to the world. 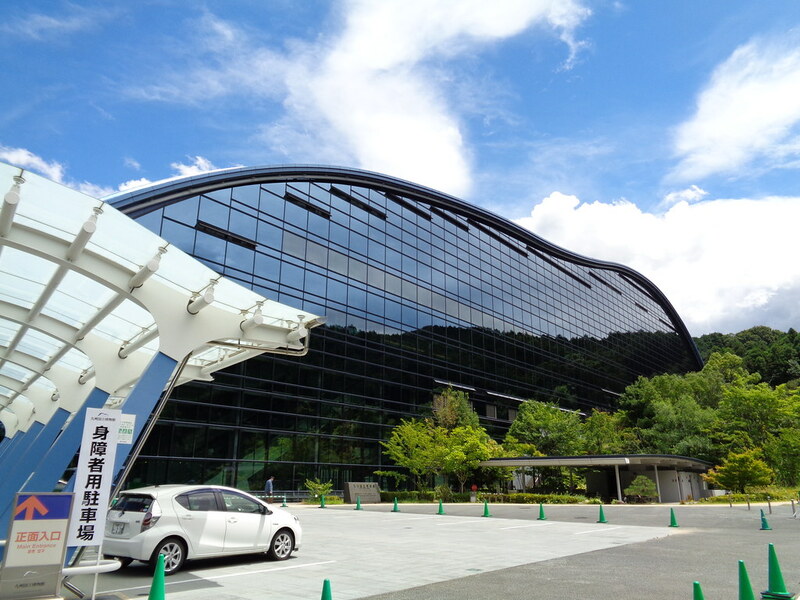 This is something the Shôkoshûseikan museum exhibits will emphasize to you time and again. Whereas most of the rest of Japan’s modernization/industrialization in the 1850s-1860s (and later) was done with Western experts, Western equipment, etc. directly imported from Europe and the United States, this earliest (and rather successful & impressive) effort by the Shimazu was done chiefly from Western /books/ alone, with Satsuma scholars reading Western materials, looking at pictures, and using their own Japanese techniques and raw materials to attempt to construct these technologies. Though as I’ve said before I’m not too interested in being a Bakumatsu/Meiji Satsuma fanboy, one has to admit this is all pretty damn impressive. I wonder how unique it is. Were Chôshû, Mito, or others doing anything at all of the sort? Of course, it’s not just industrial technology that was a major activity at the Shûseikan factory complex. 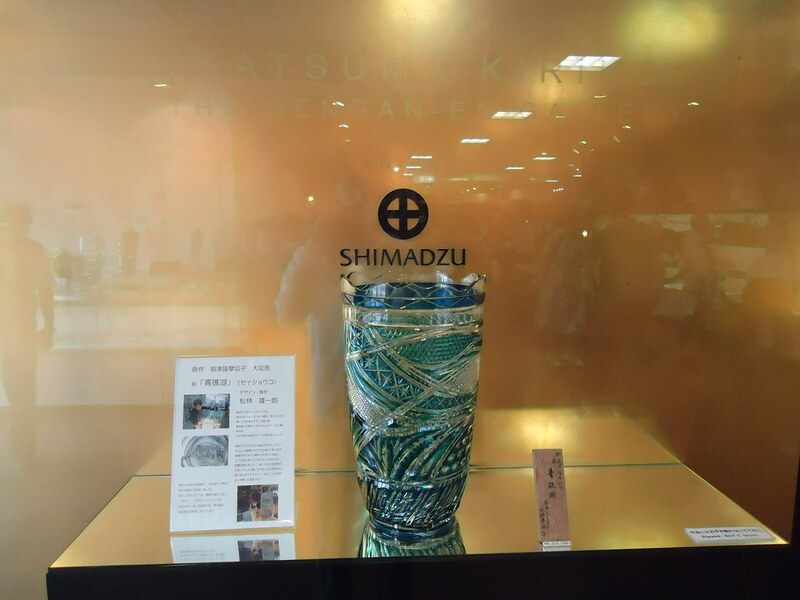 It was here, in the mid-to-late 19th century, that Satsuma wares (ceramics) and kiriko glasswares were developed and produced. Satsuma can boast all they like about these great “traditional” art forms, but so far as I’m concerned, beautiful and impressive as they are in certain ways, inventions of the Bakumatsu and Meiji periods are generally not “traditional” in my book. Especially since kiriko glassware was only produced for a very short time in the Meiji period, and then went unpracticed for the better part of a century before being revived in the 1980s. I can just imagine someone in 1890 saying “look at these marvelous glasswares; we’ve been producing them in Satsuma ever since a few years ago; they’re a great long-lasting traditional famous craft product of our region,” or someone in 1930 or 1950 saying “remember those great glasswares we produced for just a few years in the 1880s? Yeah, they really symbolize and embody Satsuma culture, Satsuma identity.” Ha. 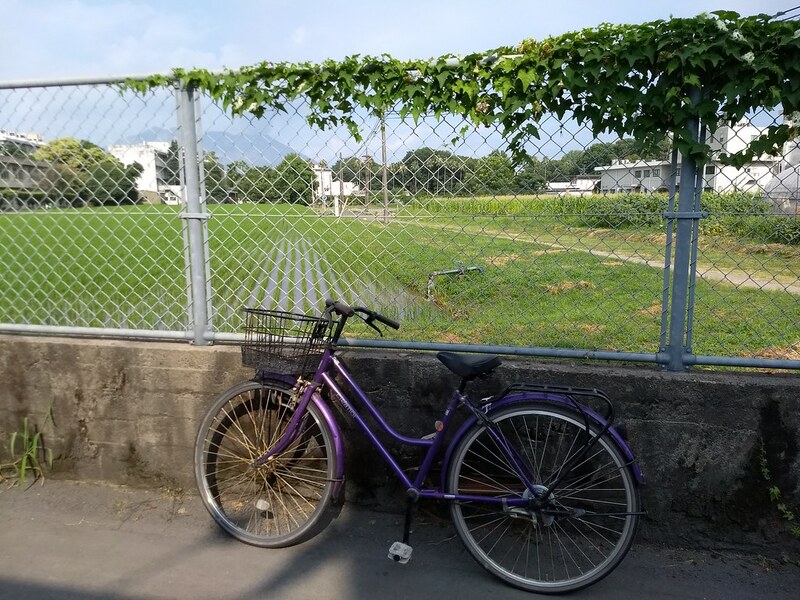 Anyway, the gardens are pretty extensive, including not only the former sites of quite a few industrial factories and the like, but also a lengthy hike up the mountain to see a great view of Sakurajima, and out over the port. A small exhibit discusses Jigen-ryû swordsmanship, of which Satsuma is oh-so-proud, and lets you try it out a bit yourself. The main entrance of the Iso Palace. A tour of the palace itself (for an extra 600 yen, and incl. a very rushed/brief tea ceremony experience at the end) is quite nice, though no photos are allowed, and though the tour is only about 20 minutes. I might have preferred to walk around on my own, at my own pace, as at so many other historical houses. We are taught that Shimazu Tadayoshi, last lord of Satsuma, kept his topknot and much of his traditional or samurai-style practices, e.g. in terms of his clothing, and the furnishings of his residence, though we are also shown fairly lavish Western-style reception rooms, complete with elaborately carved European-style wooden dining room table and chairs, a chandelier made in England & powered by the nearby hydroelectric dam, Satsuma kiriko glassware, and a European set of “china” (serving set – plates, teacups, silverware). 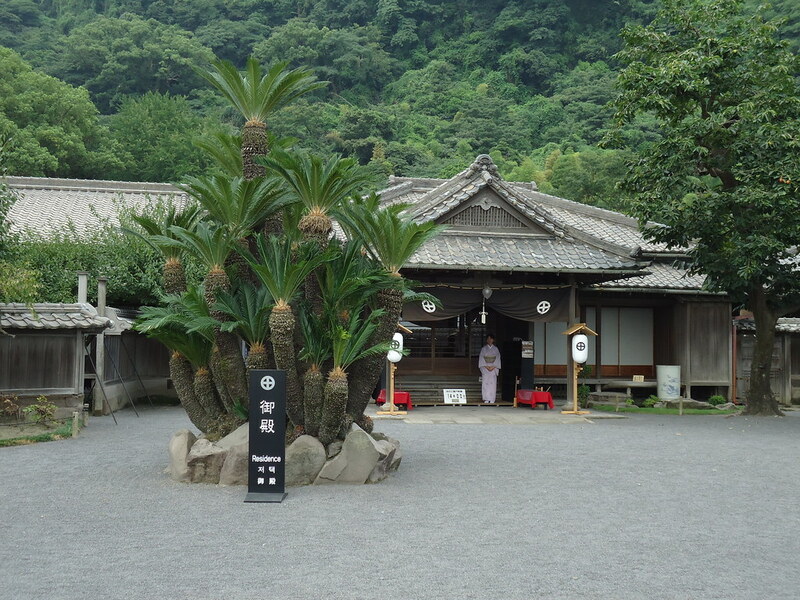 One of the highlights for me, of course, was a small pavilion gifted to the lords of Satsuma by the king of Ryukyu. It’s a pretty plain-looking thing, just a small tile-roofed and stone-floored rest space, like that you would find in a Chinese garden. I wonder if it was originally more lavishly painted, perhaps in red and gold. Today, it looks quite plain, in unpainted wood. Still, it’s a neat thing to see. 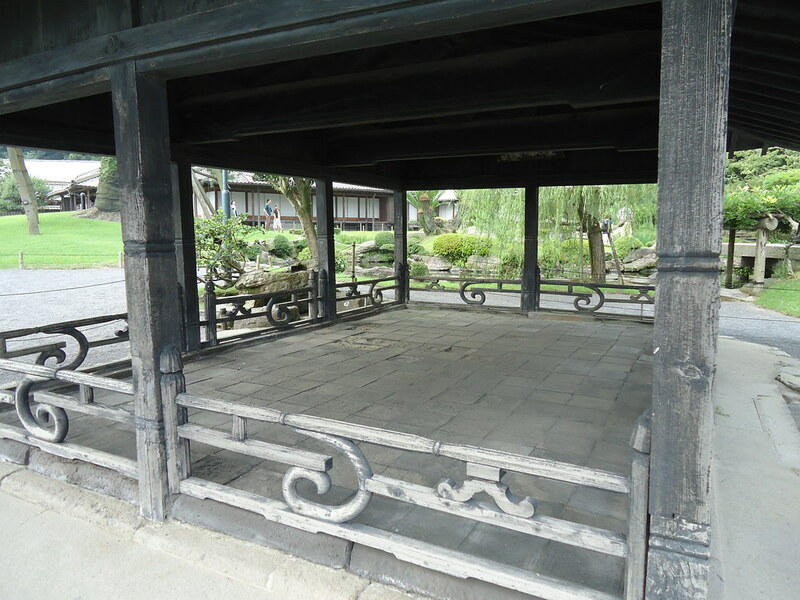 And for those who are interested in sites related to the great heroes of the Bakumatsu/Meiji, this exact pavilion was the site of a famous conversation between Katsu Kaishû and Shimazu Nariakira. Unlike a lot of formerly waterfront sites which are now further inland, due to redevelopment (land reclamation) and/or natural sedimentation or whatever, Sengan’en remains quite close to the waterfront today, with just a single road, and set of train tracks, between the compound and the beach. It’s really something to think of the Shimazu lords, relaxing in their gardens, right on the sea. Above: The main torii at Tsurugane Shrine, looking out over the water; you can see just how close Shôkoshûseikan and the Sengan’en gardens are to the water. Both compounds run right along the waterfront, with only (today) a single road, and a set of rails between the walls of the compound and the beach. Below: The innermost cloister, so to speak, of Tsurugane Shrine. The Sengan’en / Shôkoshûseikan compound also includes a Shimazu family Shinto shrine, called Tsurugane Shrine, and the two buildings of the Shôkoshûseikan Museum proper. There’s some pretty incredible stuff in here, including mainly armor, weapons, and other objects belonging to the Shimazu lords, going all the way back to the Kamakura period, as well as letters & other documents associated with the Shimazu, portraits of them, and the like. The exhibits are pretty well-done too, looking very sleek and up-to-date in style. Sadly, here too no photos are allowed, so I was forced to simply take notes best as I could, rather than photographing the gallery labels and having their full text available to look over later. The exhibits begin with the pre-modern and early modern (that is, up until 1860s) history of Satsuma, with a particular focus on (1) Satsuma as semi-independent, doing its own thing politically and economically, and possessing its own distinctive culture, and (2) Satsuma as a maritime place; the phrase “Kaiyô kokka Satsuma” (Maritime State Satsuma) appears a number of times. Following this pre-modern / early modern portion, the remainder of the exhibits – the majority – focus on Satsuma’s industrialization efforts in the 1850s-1870s or so, at the Shûseikan itself in particular. I eventually asked one of the staff about the possibility of obtaining catalogs from previous exhibits, even though I figured that their non-appearance on the shelves most likely indicated they simply weren’t for sale. To my surprise, she came back from the back room with three catalogs, and when I asked whether they were for sale, she said that for someone (like me) with a genuine interest, I could have them for free! Bam. Sometimes it really doesn’t hurt to just ask! I spent two more days in Kagoshima after that, but there’s not too much to say about those days, which were quite a bit more bara bara, as I just visited a lot of bookstores, did a little clothes shopping, got caught in the rain, poked around a few sites I hadn’t been to yet, went back to the Prefectural Library, and failed to get into the Kagoshima University Library, which is apparently closed both on weekends during the summer, and on national holidays (that Monday was Respect for the Elderly Day). 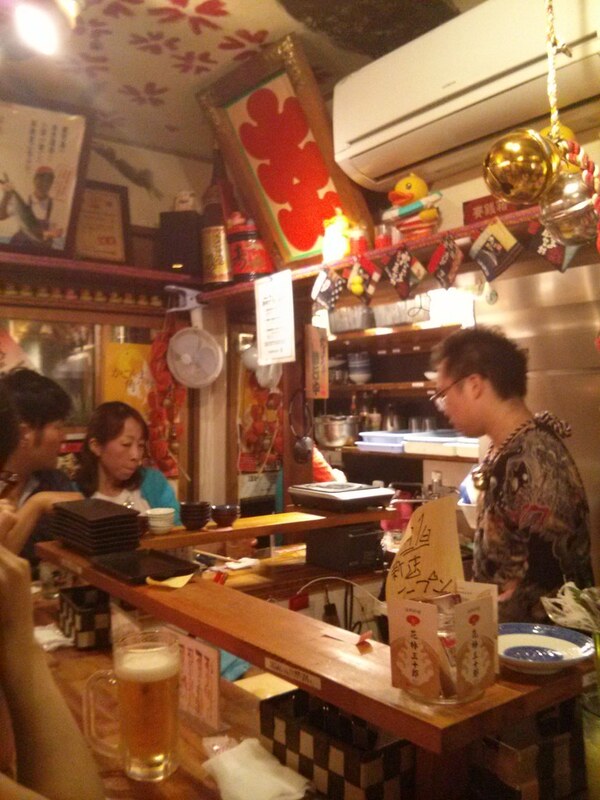 Right: Tagiruba, a small yatai bar at Kagomma Yatai-mura, specializing in buri, among other things. Highlights of these last few days included the Museum of the Meiji Restoration – which does allow photos, thanks so much!, and which features some dramatic and not too cheesy video / animatronics shows about the period – and getting to spend my last dinner in Kagoshima at a tiny yatai bar eating actual local specialties and chatting with people. The whole thing may be really touristy, I don’t know, but at least at the bar I was sitting at, there seemed to be some regulars, close friends of the main guy behind the bar. For some reason, this whole month I’ve had trouble finding good places to eat, and have ended up more often than not at family restaurants, fast food places, and the like. But in Kagoshima, I did find one place with excellent tomato ramen, and this yatai, this was an excellent way to end my time in Kagoshima. It’s a small maze of something like fifteen (maybe more) little stalls, each with only about ten or fifteen seats, at most, and each offering different local specialties. Most of them served pork of one kind or another. One specialized in Amami Islands cuisine, which would have been really cool, but it was just too too crowded. In fact, they were all crowded, and it took me four or five times walking through, and almost giving up twice, before I finally found a seat at the one place I did end up at. And the food was excellent. Buri (yellowtail) sashimi, buri “fried fish” chunks with tartar sauce, cream cheese tofu (which is a lot better than it sounds – really delicious), and good drinks and conversation. Thanks, Kagoshima! I had a blast. The next day, I was off to Okinawa. Well, I spent the last two weeks in Edo Tokyo, and didn’t post a single thing about it. Haha. How did that happen? Well, now it’s too late – my adventures are all jumbled up in my mind, and while I know I have things to say about this and that tidbit (seeking out Tanuma Okitsugu’s grave was a bit of a thing), I don’t think I could really do (or would want to do) a day-by-day recap. 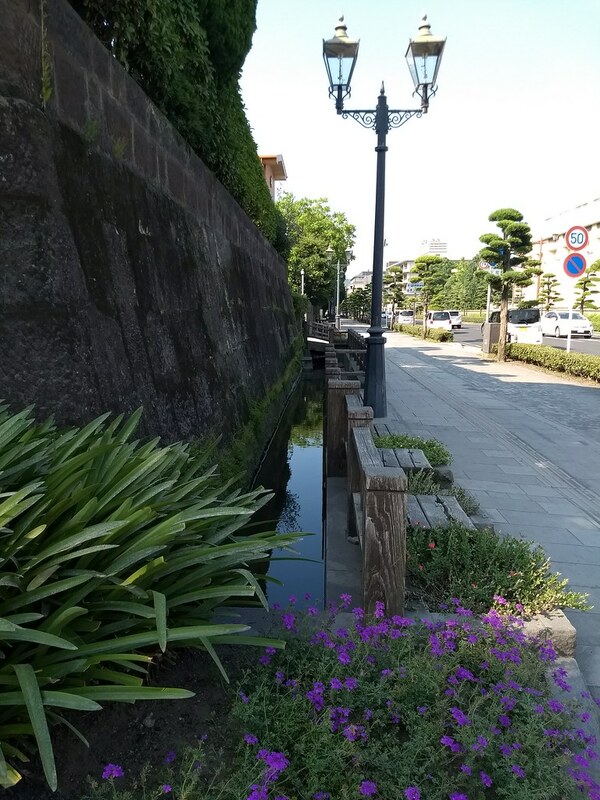 So, maybe I’ll come back to it – I know I took notes on my thoughts on visiting the former site of Edo Castle. But, for now, Kagoshima! 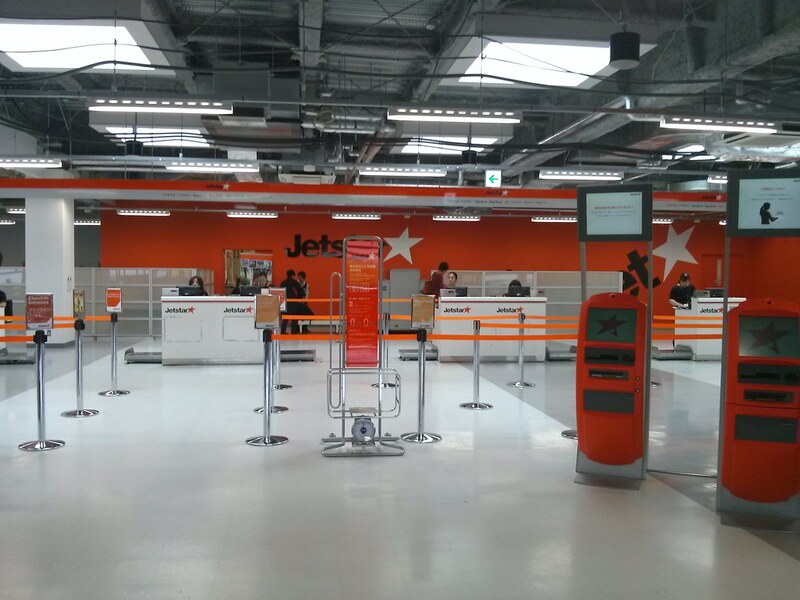 The JetStar check-in area at Narita Airport. I arrived in Kagoshima on a Tuesday; JetStar, despite being a budget airline, was much better, much nicer than US Airways, United, American, which I think really says something about the horrendous state of air travel in our country. 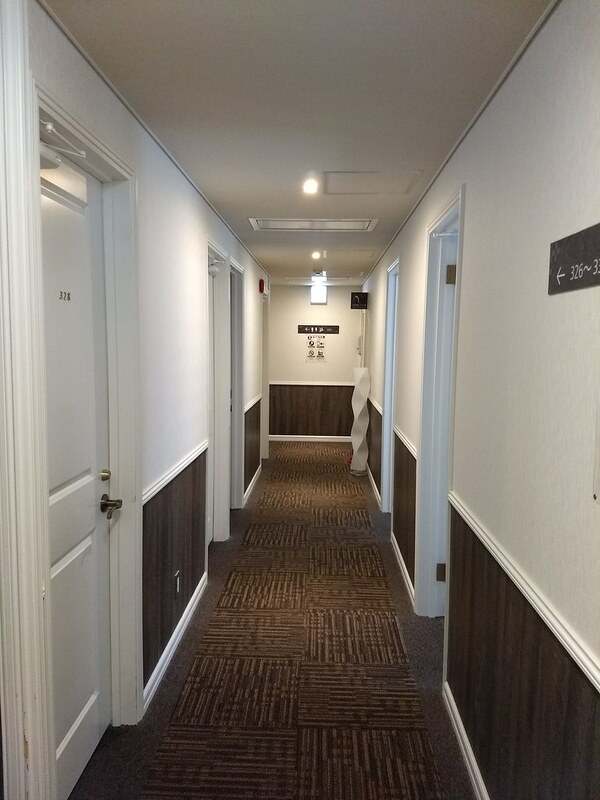 Everything was clean and sleek, check-in was a snap, and all the staff were as courteous and well-put-together as could be. Makes you actually feel like it might be the 21st century. There was a concern our flight might get diverted to Fukuoka since Sakurajima was feeling a bit more smoky that day; diversion on account of volcano! That would have been a first for me. I couldn’t remember if I’d bought travel insurance, so if we had gotten diverted, I was worried I might be footing the several hundred dollar Kyushu Shinkansen ticket myself; but, on the flip side, it would mean getting to ride the Kyushu Shinkansen, maybe getting to see some cool sites along the way, maybe even figuring out a way to stop along the way to actually explore Nagasaki, Kumamoto, Hirado, etc. Or maybe not. In any case, the flight did not get diverted, and we arrived in Kagoshima safe and sound. 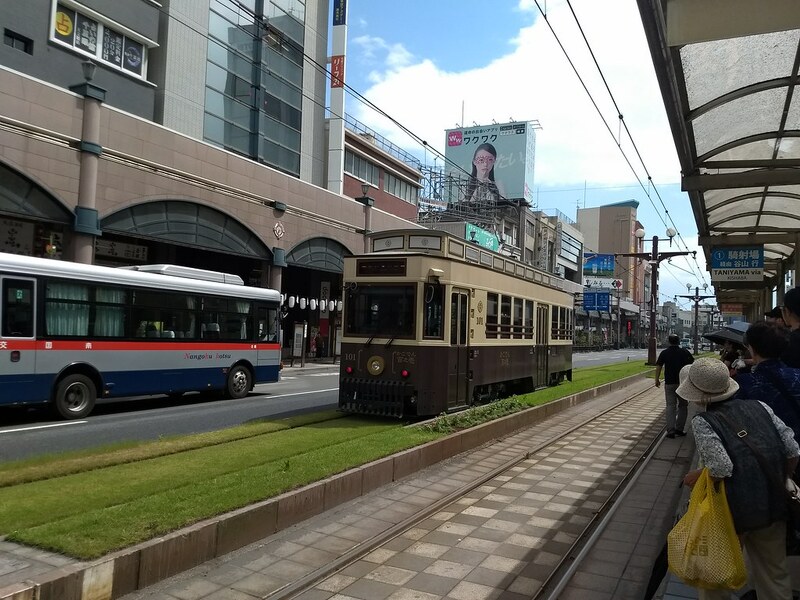 The main form of public transportation in Kagoshima is by streetcar (*ding ding*), seen here passing by the original/main location of the Yamakata-ya department store, built during the Taishô period (1912-1926). I would like to try to avoid generalizing about the character of the town – that romantic characterization thing we all do when we travel (and when we don’t) – especially since anything and everything is always too complicated for that, and anything I could say would be smoothing over, ignoring, other things. But, let me just point out some of the key features I’ve noticed so far. One, Bakumatsu, Meiji, and pre-war modernity are everywhere. 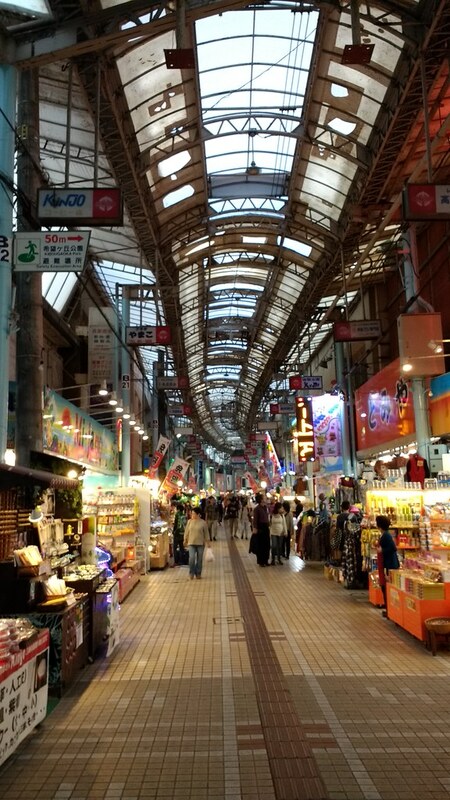 Of course Kagoshima has plenty of post-war buildings like any city does – especially a city that suffered bombing and such in the war – and, in fact, has some rather sparkling 21st century shopping malls and the like. In all truth and fairness, I cannot say that the city is dominated by any particular historical aesthetic – on a typical side street (or even along the main road), the vast majority of buildings are quite ordinary looking, meaning late 20th century or early 21st. 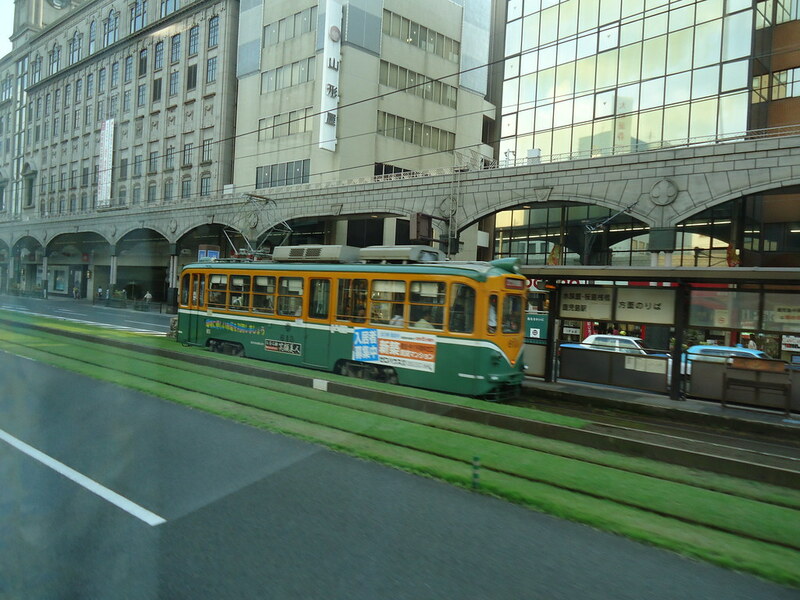 But, upon first impressions, especially first getting off of the streetcar (市電) at Tenmonkan in order to then go searching for my hotel… Tenmonkan is the historical commercial & urban culture center of Kagoshima. In the Taishô period (1912-1926), a period known for its eager adoption of Western/American urban and popular culture, Tenmonkan was Kagoshima’s center of jazz clubs, cinemas, cafés, and the like. And while it certainly doesn’t look the same today as it did then, it remains one of the city’s major shopping areas, pinned around the main/original location of the Yamakata-ya department store chain, a massive Taishô era (I think) building whose architectural motifs are carried over to line the shopping arcades for many city blocks. And having the streetcars passing by certainly helps evoke something of an imagination of what this area all looked like in the past. Incidentally, while the roads themselves are paved, of course, the streetcar tracks are grassy green strips cutting through the center of the boulevard, for the entire length of the central part of the city. I don’t know what the reasons are, but I like it. Many other historical and prominent buildings in the city are of a similar age – late 19th, early 20th century styles. 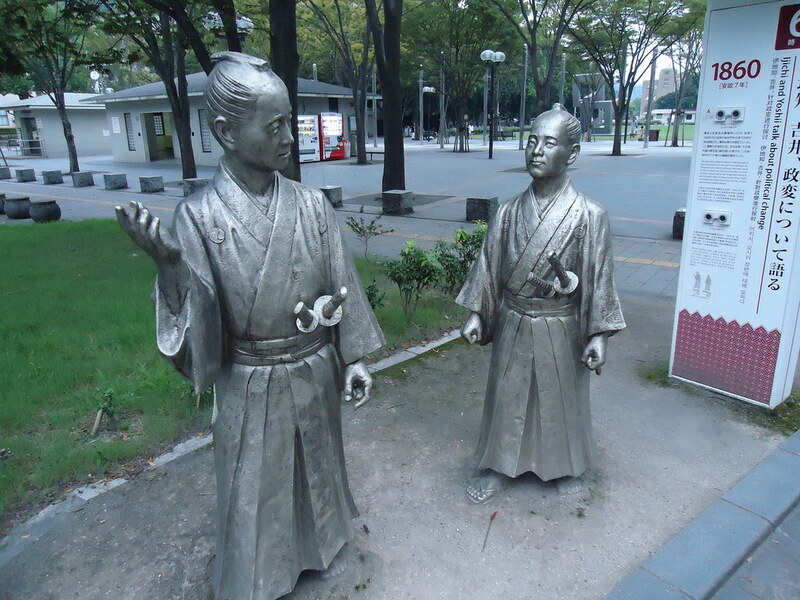 One of a handful of “living history” tableaus erected across the city; this one, relating to events of 1860, depicts a young Ichiji Shoji and Yoshii Tomozane discussing the ongoing political changes. But what’s also really prominent in the city is the focus – which comes not at all as a surprise – on Bakumatsu and Meiji history. Walk around town, and you will see not only markers and signs for historical sites related to the great heroes of the Bakumatsu & Meiji periods – Saigô Takamori, Sakamoto Ryôma, Ôkubo Toshimichi and the like – and not only grand historical statues, but quite recently erected statues, as well, by way of bringing the history more actively, more visibly, onto the streets. I certainly count myself as interested in the great modernization/Westernization of the country and of this city in particular, as one of the pioneering areas in those developments; there’s something very compelling about imagining how samurai developed the first steam engines in Japan, hydroelectric dams, and the like, simply through looking at books imported from the West, before travel or direct consultation with Western experts was possible, building some of the first Western-style / “modern” industrial factories, docks, and the like in Japan using a combination of Western technology and Japanese styles, materials, and techniques, and imagining how the city began to look in the late 19th century as these developments took hold. But, as many of the great “heroes” of Satsuma’s Bakumatsu and Meiji history are the same oft-cited “heroes” of Japanese history more broadly, I’ve long ago already become bored, tired, of their lionization. Sometimes it seems like everything is always about goddamned Saigô Takamori. 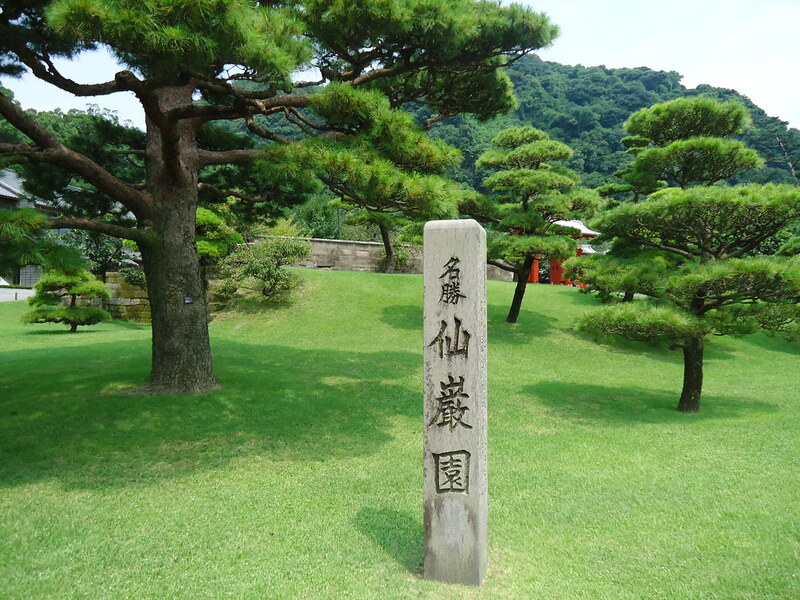 Come see Saigô’s statue, Saigô’s birthplace, the site of Saigô’s death, the site where Saigô fought off so-and-so, the site where Saigô made this famous speech. Ugh. Enough already. I get that he’s kind of sort of the George Washington of Japan – leader of the revolution, whatever. But, honestly, as if Shimazu Yoshihiro doesn’t deserve to be celebrated as a great son of Kagoshima. Where’s his giant bronze statue? You’d think Saigô was the be-all and end-all of Japanese history. Anyway, I’ll stop before getting too much further into a rant. The point is, it is interesting to see how a city defines itself, presents itself, both in the present, and in the Meiji-through-pre-war period, when so many monuments and memorials were first constructed, when the modern nation-state of Japan, its modern prefectures and cities, and their histories and identities were first being consciously constructed. Some cities, like Kanazawa and Hikone, at least from what I saw of them, are all about their castles, and their Edo period legacies. Kanazawa in particular, as home to the Maeda clan, second wealthiest samurai clan in the archipelago after the Tokugawa, has made itself known for its castle, its many still-intact Edo period samurai residences and still-operating geisha district, and traditions of ceramics, lacquerware, and gold-foiled-everything (even cakes), with extremely little emphasis, if I remember correctly, on anything Meiji or later. Here in Kagoshima, formerly home to the Shimazu, the third wealthiest samurai clan after the Maeda and the Tokugawa, we get a very different story. The castle site is there, and is now home to a pretty excellent history museum, but there are very few marked historical sites, let alone statues, of any figures significant before, say, the 1840s or 1850. 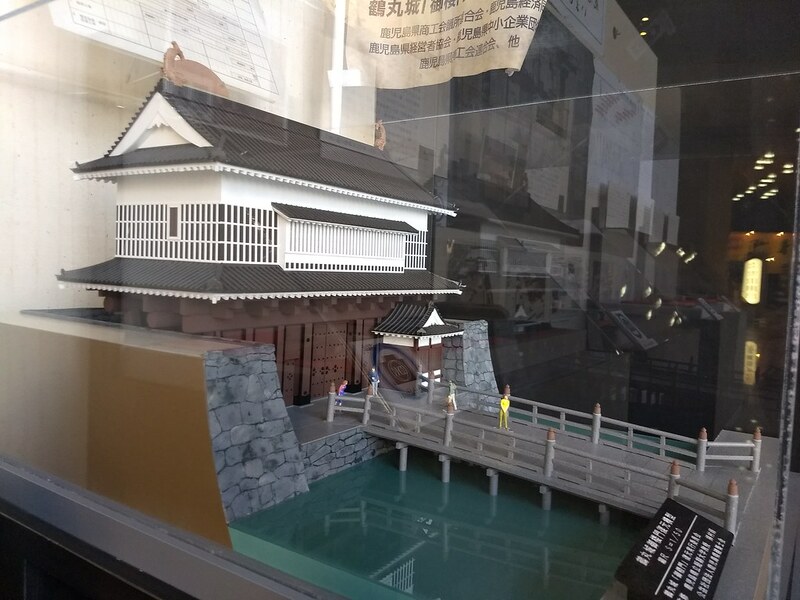 From Atsu-hime to Shimazu Nariakira to Saigô Takamori, everything is about a narrative of Kagoshima as pioneers in the modernizing of Japan, and as the birthplace of quite a few of the “founding fathers,” so to speak, of Japan’s modern revolution. 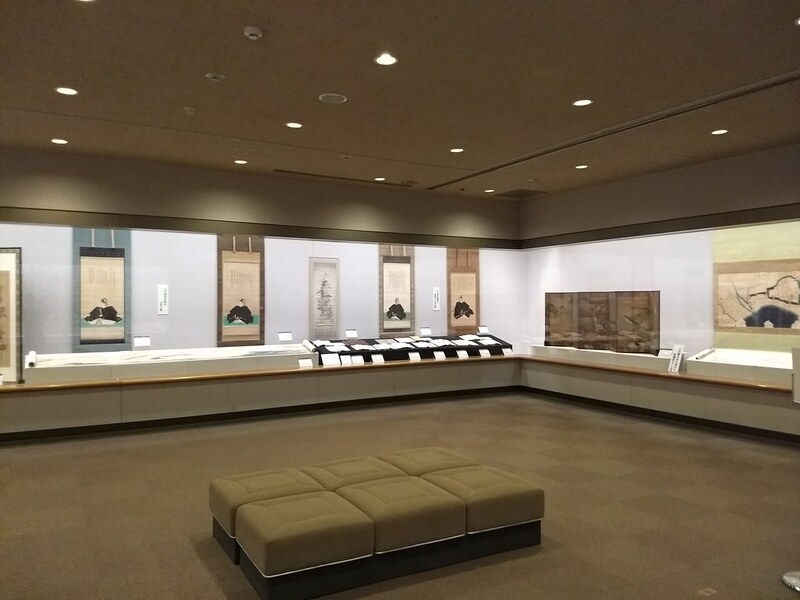 Even the more historical exhibits – particularly at the Shôkoshûseikan (one of the first factories in Japan), but even at the Reimeikan (history museum on the former site of the castle) – fit these earlier periods of Kagoshima’s medieval and early modern (Edo/Tokugawa) history into a narrative of Kagoshima having always been engaged with the sea, with being “open” to the outside world, and open to new technologies and foreign cultures, as if Satsuma knew ahead of time to be ahead of its time, everything leading up to this “opening” to the modern world in the 1850s-1870s. Incidentally, I do find something really intriguing about the idea of Satsuma as semi-independent, as enforcing its own “sakoku within a sakoku,” developing its own culture and pushing its own agendas. Which isn’t to say that other regions/domains weren’t doing the same, to one extent or another, but if there is any truth to the notion of Kagoshima being more seriously a major center of cultural and economic developments of a decidedly separate nature from that of Kyoto, Osaka, Edo – the core and source of much of “Japanese” history and tradition as we hear it from the national level – rather than being a provincial backwater, I’d be curious to hear more about it. But, returning to the point, even as early as Meiji, Kagoshima was celebrating its own modernity, and quite understandably so. One can easily imagine a city – home to much of the earliest “modern” industrial / technological developments in Japan, and to many of the most powerful politicians/bureaucrats in pre-war Japan – desperately trying to push itself up into being a major city, and not a provincial backwater. Right: Statue of Shimazu Hisamitsu at Tanshôen Gardens, one of three massive bronze statues of mid-19th century Shimazu lords erected there in 1917. The Terukuni Shrine, a site, of course, as a Shinto shrine, of largely traditional architecture, customs/practices, and beliefs, features gaslamps right alongside the more traditional stone lanterns, and in the neighboring Tanshôen Gardens, three massive statues were erected in 1917, honoring three generations of Shimazu lords who ruled over the city’s modernization. I love these statues, because they are just so laughably massive, and because they are precisely the kind of thing that could only have been erected in the late 19th or early 20th centuries, when that particular brand of nationalism, demonstrated through monuments and memorials, was all the rage. And, of course, no doubt that the Shimazu, still plenty wealthy and powerful into the 20th century in large part because of their industrial operations, would want to build as big as they could. Admittedly, I’ve seen some pretty massive Buddhist sculptures elsewhere, but that’s a whole other thing; I’m not sure if I recall ever seeing any other historical figures in Japan put on such a pedestal – literally! – as these three Shimazus at Tanshôen, and Saigô across town. One can only imagine how things might have gone differently, if Kagoshima were today to have become (or remained) the far more major city that people in the late 19th and early 20th centuries were trying to represent it as being. If we’re going to be talking about the character of Kagoshima as a city, there is another side to it too. 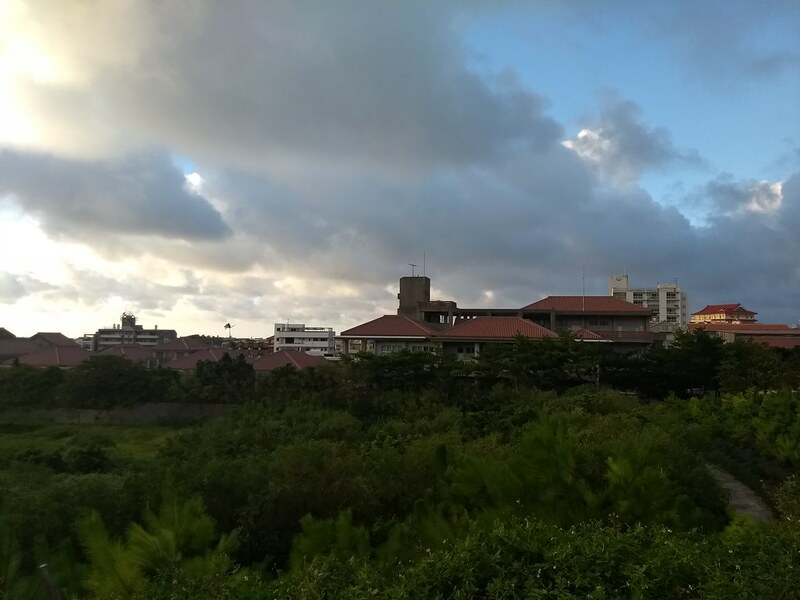 Walking around Tenmonkan, and near the castle, and all the places I spoke of above you wouldn’t necessarily see it, but go out to the Shôkoshûseikan, and other more northerly parts of the city, and you find that Kagoshima is also very much a maritime town, and a beach town. I don’t want to go on and on about it too much, since this post is already really long, but suffice it to say that there is a certain something, a certain aesthetic, a certain atmosphere, that you get in beach towns that you don’t really get elsewhere. I didn’t find anywhere in Kagoshima that feels quite so strongly of that as in certain parts of Naha, to be sure, but even so, looking out from Tsurugane Shrine (at the Shôkoshûseikan complex), through/past the torii, to the sea, I can’t help but be reminded of that small shrine in Ôgimi-son, the village in northern Okinawa I visited last summer. As seems to be the case everywhere, areas of the city which were once waterfront property only a few hundred years ago are considerably less so today, so we have to try to imagine… But, picturing the Shimazu second residence, at the Iso Palace (later, the site of the Shôkoshûseikan factory compound), being right on the water, and even the castle itself being only ten or fifteen blocks from a very active port, kind of gives you a different sense of the character of the town. 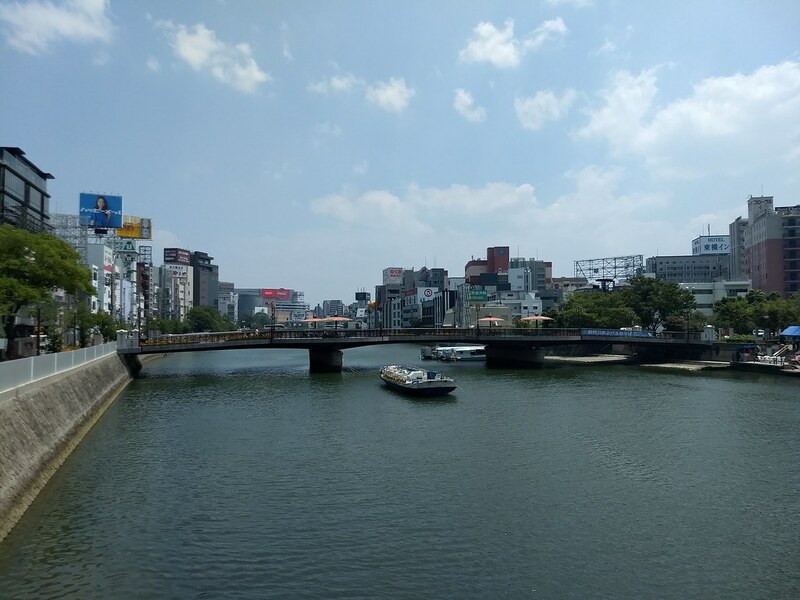 Not so much in town, but out by the Shûseikan, I saw ads for jetskiing, stand-up paddleboarding, etc. advertising that it’s good weather for that year-round in Kagoshima, and just really emphasizing the water sports aspect of Kagoshima tourism. And perhaps more to the point, there’s just something about being able to see the sea, and thinking about how certain buildings stand there overlooking the sea, that just gives them a very different feeling. 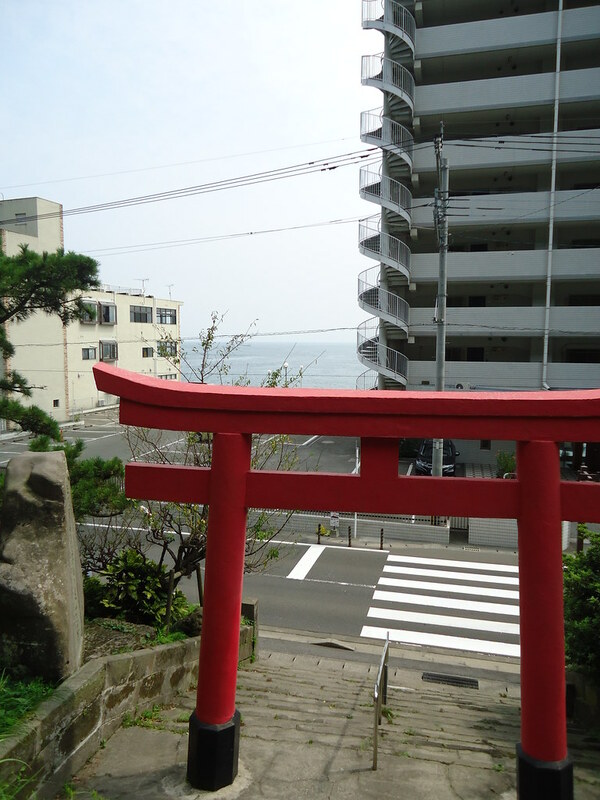 A small branch shrine of Yasaka Shrine, located a short walk away from the Shûseikan, and from which you can see the ocean just a couple blocks away, gives this feeling, though it’s not quite as directly associated with the beach as, for example, “Above the Waves” (Naminoue) Shrine in Okinawa. Just looking at the slight wear on the main shrine building, who knows if there’s really anything about that wear that marks it as distinctively coming from sea spray or maritime moisture coming up off the water, but you sure do get that feeling. Above: The main torii at Yasaka Shrine, Iso neighborhood, Kagoshima; Below: the shrine’s main worship hall, a short walk from the Shôkoshûseikan, and just a block or so from the beach. I have one post on tap summarizing my first full day in Kagoshima – a sort of walking tour history like so many travel blogs do, like my second and third posts on Sakura from last year. And, like I said, I have some topics about my time in Tokyo I’m hoping to come back to. But, we’ll see how much I end up doing for the second and third days, or how far I fall behind. Stay tuned!